Welcome to EPM Landscape Leeds. If you're looking for an elegant and ambient garden to relax in and enjoy, then EPM Landscape have the solution you need. EPM Landscape are a highly skilled company based in Drighlington, with over 15 years' experience. 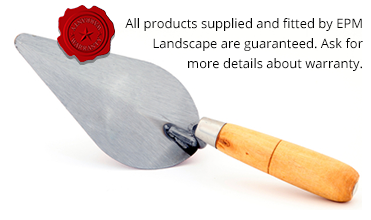 We offer a range of services that will give you the garden that you can take pride in. From the outset we can offer all the design, construction and maintenance help that you could ever need. Our projects range from small domestic jobs to industrial estates, schools and commercial sites. At EPM Landscape we pride ourselves on our professional quality of work, reliability and competitive quotations. Because of the quality of our work and our friendly manner whilst on site, 80% of our work comes from customer recommendation and repeat business which we are highly grateful for.